Originally designed for the Federal Land Bank in 1926, the building was acquired in 1937 by the Puerto Rico Chamber of Commerce who still occupies it. It is located in Old San Juan where streets are very narrow and there is not much room to appreciate its architecture from a distance. It is on the same street two blocks west of the Bank of Nova Scotia Building . 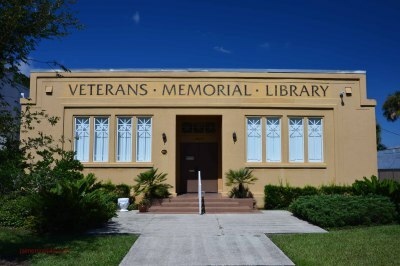 Though the Federal Land Bank building is bigger, to some extent it has a resemblance with the Veteran's Memorial Library in St. Cloud, FL which is a Prairie Style designed by Isabel Roberts in 1922. Removing the columns in the Nechodoma design, the Prairie Style is clearly identifiable in both structures. Due to the columns, this design has also been described as Grecian Style, but is reminiscent of Prairie Style bank buildings in the Midwest. Nechodoma added the columns which is a Grecian Style feature, nonetheless the overall characteristics are those of the Prairie Style. It was one of the last works of Nechodoma before his death in a car accident in 1928.